Parents, You’re Doing it Right! I’m writing this knowing that several ½ finished blogs are going to feed into this single post, and I’m not exactly sure where this will go. But let me tell you something. . . Yes, you heard me. You. ARE. DOING. IT. RIGHT. I don’t need to talk with you to know what your parenting challenge is right now. Why? Because you’re here and you’re trying. You see, pregnancy, parenting, relationships, LIFE happens on a spectrum. So whatever you’re doing right now for your baby- is right! Now, I know you’re busy reading blogs and getting advice from parenting forums, and somewhere you’ve come across information that makes you feel like you’re doing something wrong. Are you doing attachment-parenting correctly? Do you “count” as an attachment-parent? What if your attachment-parenting doesn’t resonate with you? Let’s take baby sleep for example. Maybe your baby isn’t sleeping through the night, so someone tells you that you need to sleep train your baby. That’s ok, if it is right for you and your family! And, I guarantee that someone else is going to tell you that you need to “just accept the realities of parenting” and that babies don’t sleep through the night. Well, that’s ok too- if it is right for your family. You see, there is no right or wrong. There are millions of ways to parent (including attachment parent). The relationships between you, partners, and your child are 100% unique- that’s why the spectrums of parenting are so broad. Since we’ve introduced sleep training, a lot of people have wondered how I can “reconcile” sleep training a baby with being a doula. My response is that offering sleep coaching is exactly in line of being a doula! Why wouldn’t I support you in sleep training your baby? As a doula, I support you whether you want an epidural or a homebirth or a scheduled cesarean birth. Birth happens on a spectrum. Why wouldn’t I also support you in your sleep choices? I help many families safely and comfortably co-sleep (which by the way, is it’s own spectrum!). I’m not going to START being judgmental at sleep training. Look. 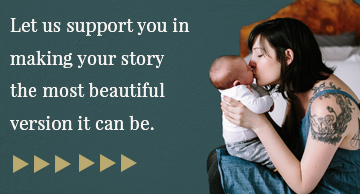 We each struggle with our own challenges, our own relationships with our babies. We need to realize that we aren’t the same as any other person or parent/baby relationship out there- we fall within this vast spectrum where there are a million different approaches that may work for you and your baby. So who am I or anyone else to say that you’re doing it wrong? I know I’m not going to do that, instead, I’m going to tell you you’re doing it right and support you in what works for you. Then, I’m going to support you towards feeling confident in your place on the spectrum of parenting. Here’s to Just Parenting and doing it right! Tiffany is a birth and postpartum doula in Portland, Oregon and owner of Birthing Stone Doulas. She believes in truly non-judgmental support for families and strives to offer services that adjust to the parents no matter where they fall on the parenting and birthing spectrum.